In December we posted the news about our recommendation for this week in our Summer Series: Prince of Broadway. It is currently in previews and will open August 24th. It is a musical that celebrates the career of Broadway legend, and our dear friend, Harold Prince. Over the span of his career, Hal has received 21 Tony Awards, a Kennedy Center Honor, and a National Medal of the Arts from President Clinton. His long list of productions have helped shape Broadway with shows such as Fiddler on The Roof, Damn Yankees, West Side Story, A Funny Thing Happened on the Way to the Forum, Sweeney Todd, Evita, The Phantom of the Opera, Cabaret, Follies, A Little Night Music, and Show Boat to name a few! This is one show you absolutely do not want to miss! Click here to order tickets or to learn more. We are so happy for Hal—and wish him the best of success for this exciting show. Remember the Stratford Shakespeare Festival project we have been discussing over the last few months? I know that my father, Lawrence (founder of the Stratford Shakespeare Festival), is looking down and so very happy right at this moment. As his son, I’m so very grateful that I was part of this process to see the Festival restored and know that Shakespeare Theatre will continue in Stratford. 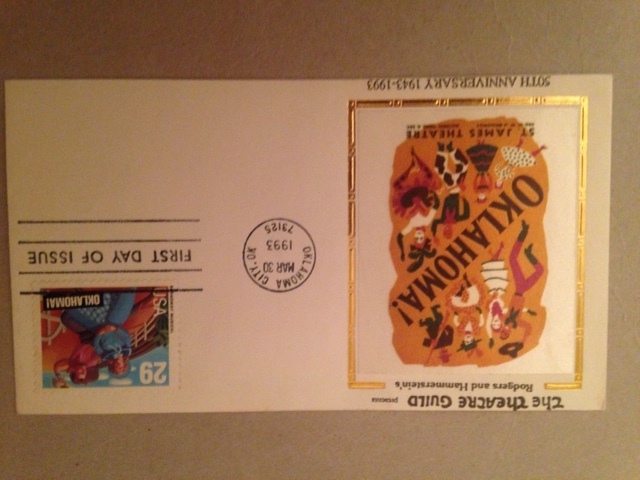 After we sent out the letter from the Dramatist Guild urging you to contact the U.S. Postal Service regarding a commemorative stamp, we started reminiscing and looking through our collections of first issue stamps that we just love—and of course, why we think it’s so important for these stamps to be created! Of course, this is one of our favorites. It’s kind of hard to pick A favorite, but this would be close—given our history with Oklahoma! and Rodgers & Hammerstein. We (and by we, I mean The Theatre Guild, which at that time was under direction of Lawrence and Armina Langner and Theresa Helburn) opened Oklahoma! on Broadway March 31, 1943 at the St. James Theatre. It ran for 5 years with over 2,212 performances—by far the most successful play of its time! We have always loved this play—and movie! You can watch it instantly on Amazon or to purchase it and watch it anytime, you can find it on our Amazon store! The Magic Curtain is the autobiography of my father, Lawrence Langner, founder of The Theatre Guild. It is filled with great stories about the theatre, his life, the world as he saw it, and of course, there are tons of pictures! We found it recently on Amazon (of course—you can find everything there!) and I thought I’d pass along the link (click on the book below), if you were interested! 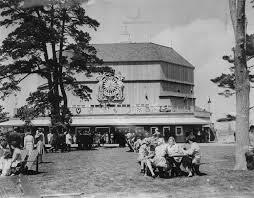 For this Throwback Thursday, I found this great picture of The Shakespeare Festival in Stratford, CT. The festival was founded by my father, Lawrence Langner (who adored Shakespeare) in 1955. The theatre ran for nearly 30 years and closed in 1982. On the 25th of September, the town of Stratford will decide its future and whether to bring back the Festival. A great theatre lover, David D. Reed is eagerly hoping so and a few weeks ago he hosted a wonderful celebration in the hopes that Stratford will continue the wonderful tradition of Shakespeare on his 450th Birthday! Marilyn and I went up to Stratford for this celebration and we had such a wonderful time. We sincerely believe that David Reed is the man who can make this glorious dream come true!